Unger Excella Floor Wax Backpack Applicator is your answer to making floor wax application a breeze. Unger has built this kit with ergonomics in mind to make it the safest and most efficient floor finishing option around. The kit comes in a 18 inch head model or a 24 inch model. 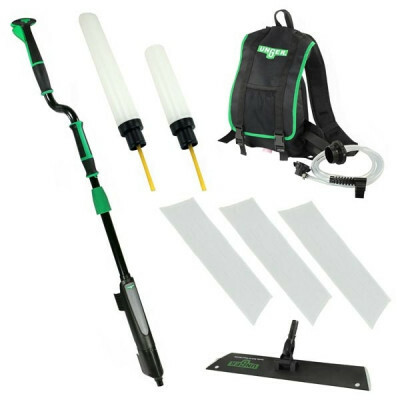 The applicator pole is can be adjusted from 48 to 65 inches, has rubber coated non-slip dual swivel handles, and is offset to make stearing the unit easy and comfortable. This unit comes with a range of options for distributing your liquid to the floor. This kit comes with two bottles (0.5 liter bottle and 1 liter bottle) that mount right on the pole. The kit also includes a backpack for holding up to 5 liters, which allows you to cover more floor between refills while removing the weight the pole to make it lighter and more maneuverable. Be sure to clean out your tanks and bladders between each use to avoid clumps or blockage with the help of our maintenance guide. Customers who were interested in the Unger® Excella™ Floor Wax Backpack Applicator were also interested in the following items. Terrible product for floor finish or wax. I just got mine and used it for the first time with floor finish and all three of the valves were plugged in a very short time. Probably a good product for simple floor mopping. Would not recommend. This is a review for the Unger® Excella™ Floor Wax Backpack Applicator.